We acknowledge these events will be taking place on stolen land, on the traditional territory of the L'kwungen peoples, the Songhees and Esquimalt Nations. 1. People and the planet before profit. 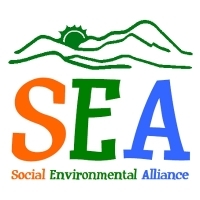 The Social Environmental Alliance is committed to a world where the wellbeing of people and the planet takes priority over the accumulation of private wealth. 2. Respect for ecological systems. We believe all human activity and social systems must operate within the limits imposed by ecological systems and with respect for non-human life. Recognizing the dangers of catastrophic climate change, the injustice of colonization and imperialism, and the inhumanity of growing poverty in the midst of plenty, we pledge ourselves to the lifelong project of transformative social change. 4. Ecological and democratic socialist principles. We aim to accomplish our objectives through the application of ecological and democratic socialist principles to public affairs and the governance of our communities. 5. Grassroots organization and action. Committed to action and outreach, we are nurturing a community of organizers to mobilize the consciousness and confidence of ordinary people and forge alliances in coalition with social movements, cultural organizations and grassroots community groups. We are guided by the best traditions of indigenous, feminist, co-operative, socialist, labour and environmental movements. We embrace a participatory, pluralistic and emancipatory model of democracy. We believe in a classless society and in the inherent dignity and equality of all people on the basis of gender, sexuality, ethnicity, religion, age and ability. We recognize the right of indigenous and colonized peoples to self-determination. We embrace an internationalist perspective in foreign policy based on equality among peoples and the shared stewardship and fair distribution of the finite resources of the planet.